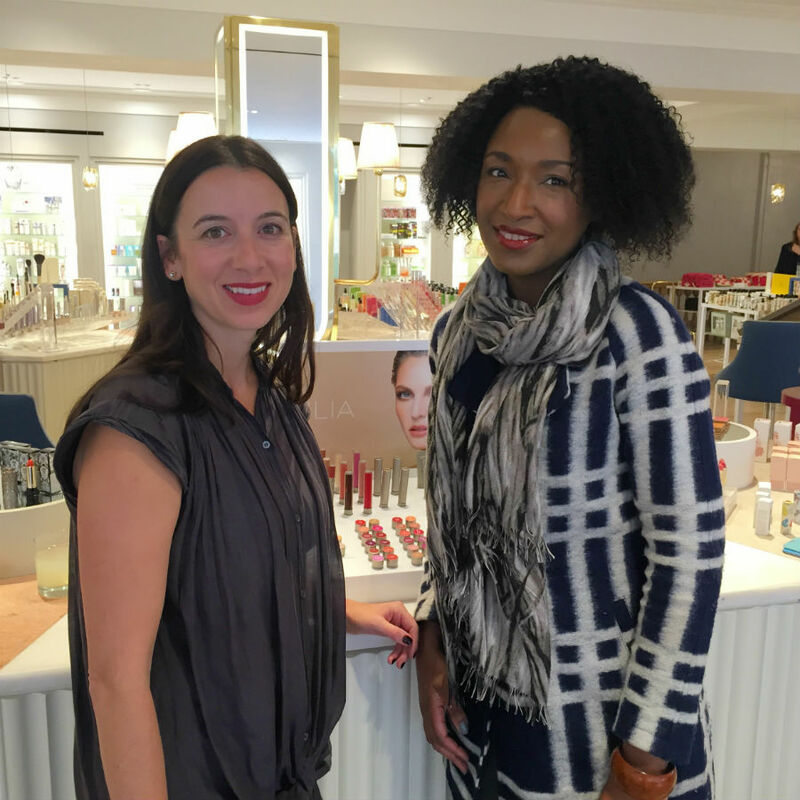 Sasha Plavsic, creator of one of my favourite beauty brands, ILIA was in London for a flying visit last week and lucky me had the chance to have some time with her to chat about the company and get an exclusive look at the brand new makeup items. Squeal. We were in the genteel setting of the Queen’s grocer, Fortnum & Mason, home to the most elegant department store Beauty Hall, so I had to contain myself (inner squealing). 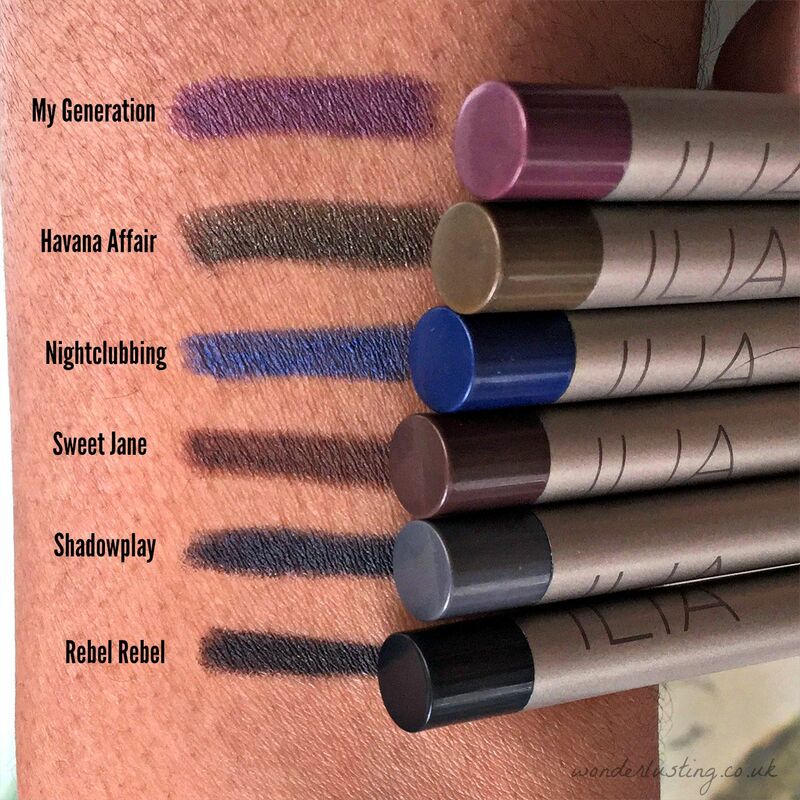 If you’re an ILIA fan (read more here about why I am), or just a fan of beautifully formulated makeup in chic packaging, then you are in for a treat. With a background in branding and design, Sasha’s aim was to create a natural line that could sit as beauty equivalents of her and her friends’ favourite fashion labels including Isabel Marant and Alexander Wang. Contempory, chic, style with substance. Since launching in 2011 with a collection of six tinted lip conditioners, the line has expanded and now offers over 30 lip products which are the go-to lippies for many a green and glam gal. Sasha’s plan from the start was always to offer a full colour line and there is also mascara, bronzer, highlighters and powder. Last year a concealer and tinted moisturiser joined the collection and now we have eyeshadow, eyeliner, foundation and brushes. Next in the pipeline for 2016 is powder products. Below are swatches and my first impressions of the new products. The eyeliners are very creamy and pigmented, gliding on depositing colour without pulling. The six colours are a mix of standard staples and pops of colour – all with a metallic shimmer adding a bit of a rock chick twist. The colours are versatile and can be daytime friendly even with the shimmer which can be blended down for a subtle look or layered for intensity. I especially love the drama of the top three colours below. Like the eyeliners, the silken shadow sticks glide on. You can really feel all those skin-loving ingredients at work. With a light hand, you get a gorgeous wash of colour or else buiild up. All the eye products are very blendable. I’m not sure whether creasing could be an issue or not. Take On Me would look drop dead on the lips too I think. If you’re an 80’s kid, you’ll recognise a few song names and I bet you’re humming now. I haven’t been able to get rid of the A-ha ear worm! 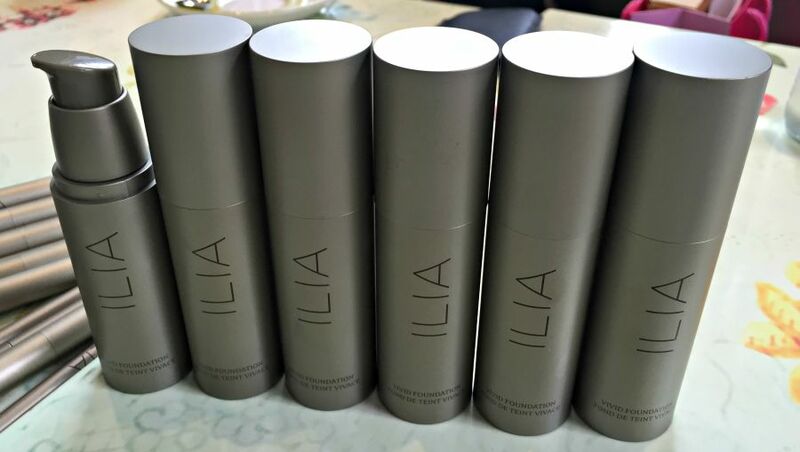 “ILIA Vivid Foundation is filled with healing botanicals to help calm and revitalize the skin. The moisturizing properties of Aloe Vera aid in long-lasting hydration and simulate a tightening of the skin, while the healing nature of Green Tea and Rosemary Extract help combat free radicals. My favourite formula for foundation on my dry skin is liquid. However options are quite limited with natural and organic brands which tend to be mineral powder-based so I was excited to see this. The buildable medium coverage formula, full of skin nourishing oils felt heavenly, especially as we head in to colder weather. The unique ingredient mentioned is mastic. I’ve eaten mastic on my travels in Cyprus but don’t recall ever seeing it elsewhere or used in a beauty product – most intriguing! 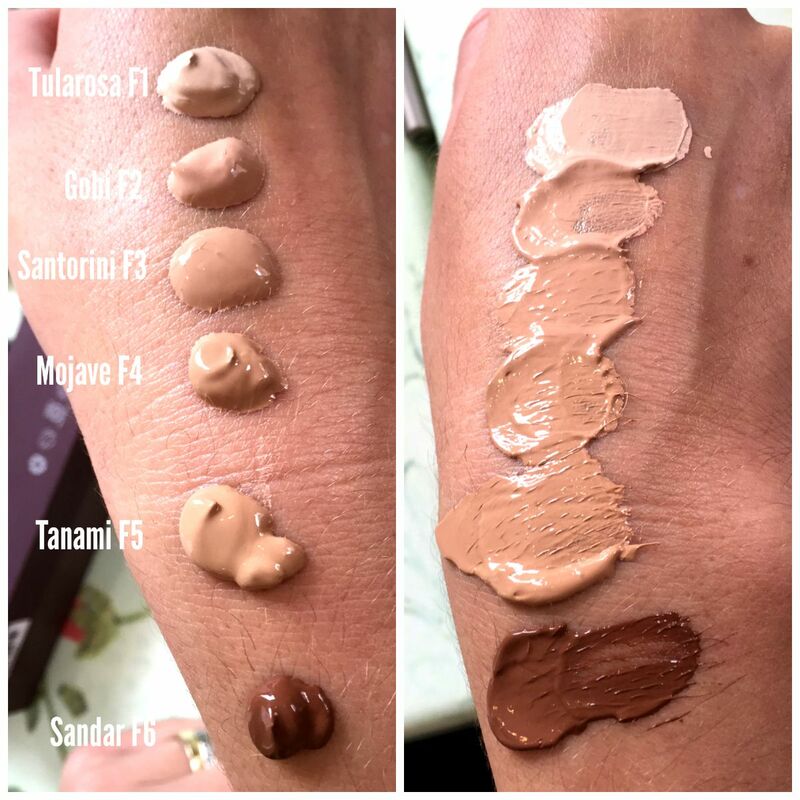 The foundation is also silicone-free which is good news. Sasha suggested wearing this on top of the tinted moisturiser for extra coverage. 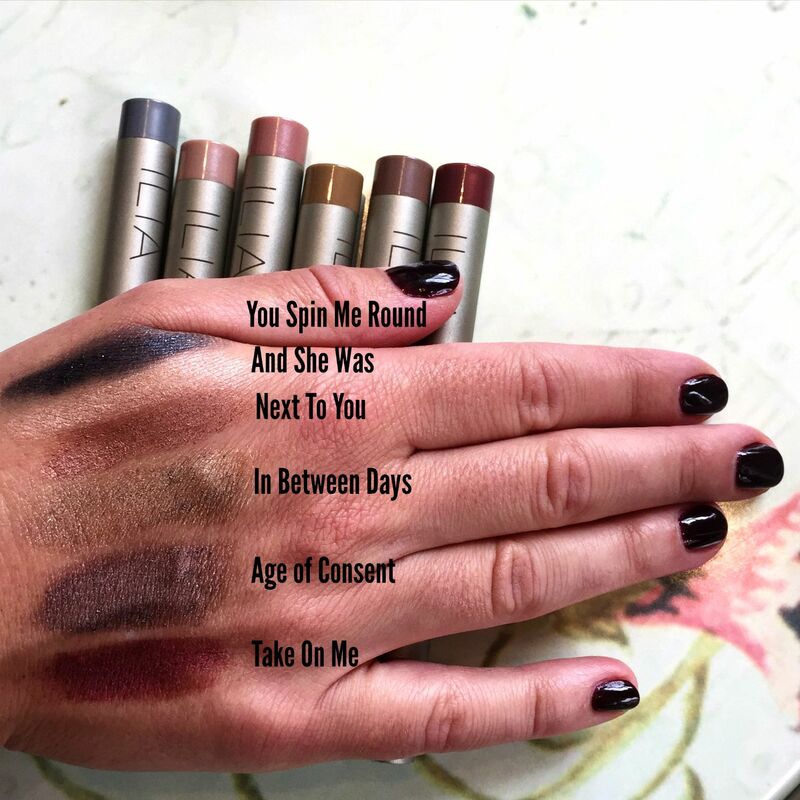 The are six shades with various undertones, all named after deserts around the world. 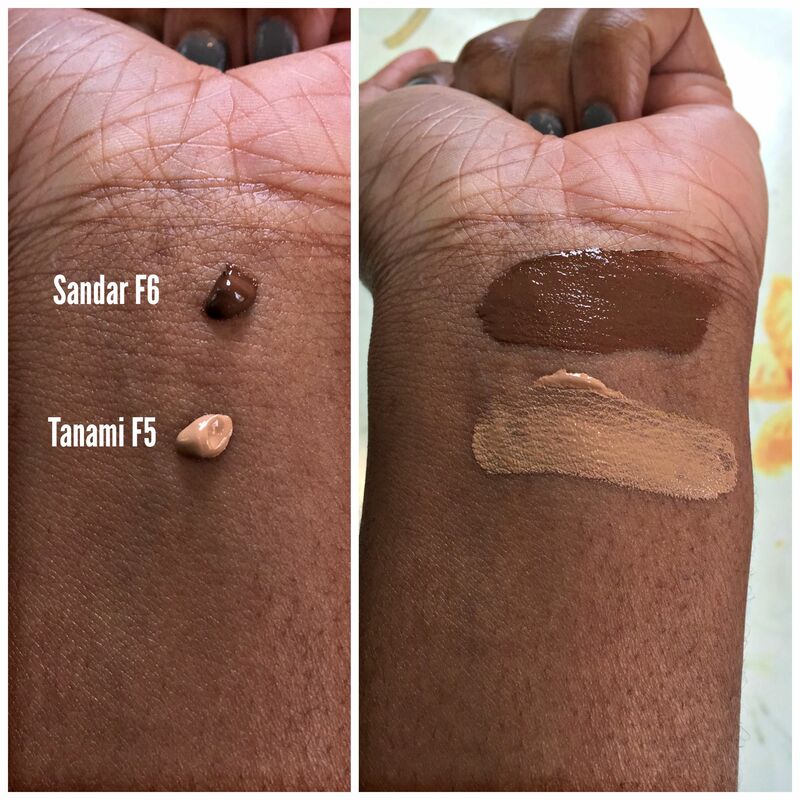 For darker skin tones, as you can see there’s a big leap between the two darkest colours. I was thrilled to see a deep option however a few shades in between wouldn’t go amiss. Sasha did mention more options were being worked on which was music to my ears. I didn’t get to see these. Both are made from synthetic Taklon and are cruelty free. Favourite product not created by herself? Sasha uses everything (obvs) and likes blending multiple products. On the day we met on her lips she was wearing 99 Red Balloons, Arabian Knights and Lust for Life. Out of everything, the colour she reaches for most often is Arabian Knights. 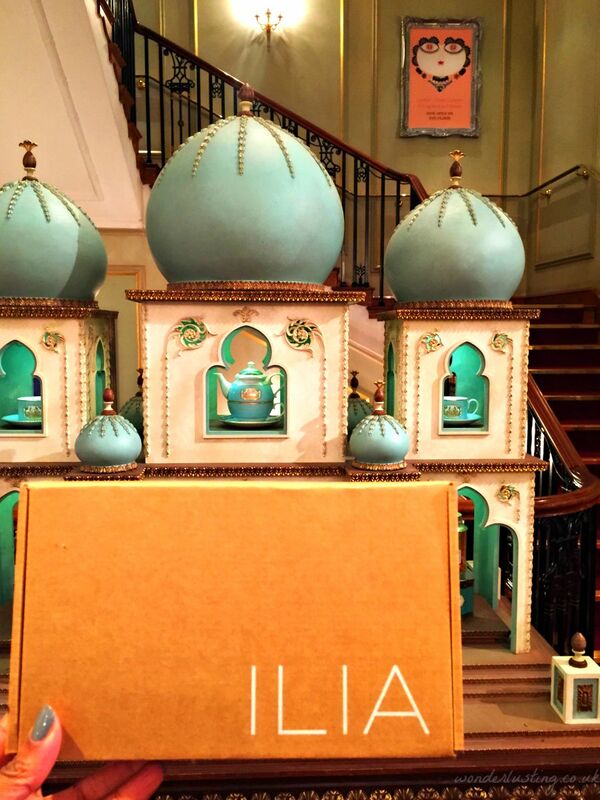 So which of the new ILIA products are catching your eye? Lucky girl! 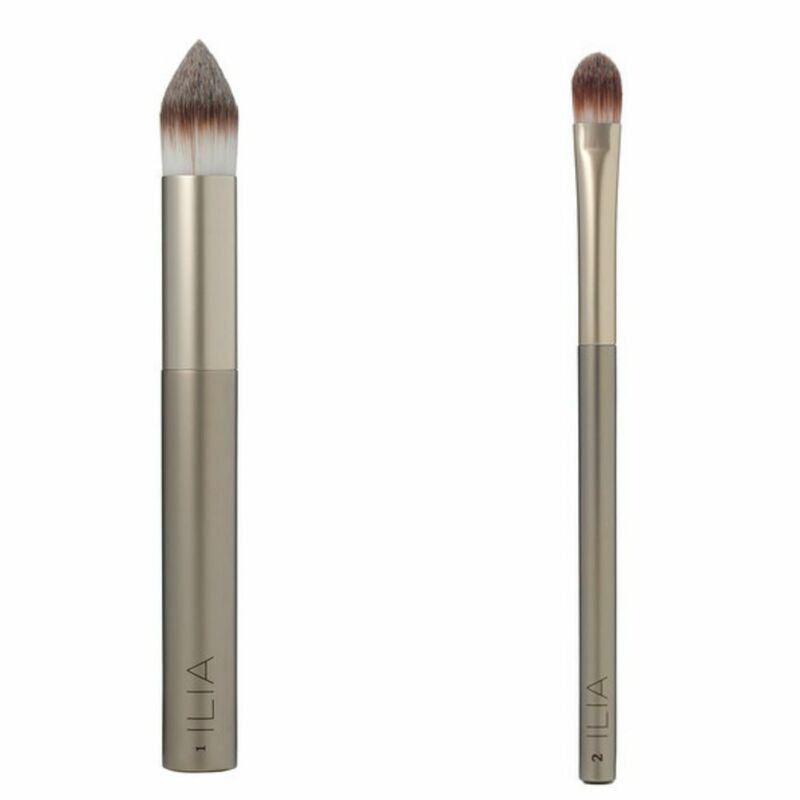 I haven’t tried anything from Ilia yet – I now have a couple of products in my basket waiting for me to press ‘checkout’! They’re really lovely formulations. I’ve always got my basket ready for a special offer to come along! I think Mojave is the nearest shade though to my eye it’s a tiny bit darker than Illusion. I’ll be in a shop that sells both brands at the weekend and can check side by side if you like.